Facebook Inc easily beat Wall Street’s profit estimates, soothing investor concerns that increased spending on the privacy of its users would blunt growth. The world’s largest online social media network has pledged to invest heavily in the privacy and security of its users after scandals over improperly shared data and propaganda hurt its image and made it the target of political scrutiny across the globe. Facebook shares rose nearly 12 percent to $168.20 after the bell. They closed up 4.3 percent in regular trading. Net income rose to $6.88 billion, or $2.38 per share, in the fourth quarter, up from $4.27 billion, or $1.44 per share, a year earlier. Analysts on average had expected earnings of $2.19 per share, according to IBES data from Refinitiv. Total fourth-quarter revenue rose 30 percent to $16.9 billion from $12.97 billion, compared to analysts’ average estimate of $16.4 billion. The company’s shares have lost a third of their value since July, when it first warned about slowing growth in revenue and operating margin. The share price remains near its lowest point in two years. “We’ve fundamentally changed how we run our company to focus on the biggest social issues, and we’re investing more to build new and inspiring ways for people to connect,” Mark Zuckerberg, Facebook’s founder and chief executive, said in a statement. Previously, Facebook’s weakest quarterly sales growth as a publicly traded company, 32.2 percent, came in each of its first two reporting quarters in 2012. Total expenses in the fourth quarter surged to $9.1 billion, up 62 percent compared with a year ago. The operating margin fell to 46 percent in the fourth quarter from 57 percent a year ago. Facebook after reporting earnings that its total revenue growth rate this quarter would decelerate by mid-single digits, excluding currency fluctuations, compared to the fourth quarter, and would continue to slow down throughout the year. It said it continued to expect 2019 total expenses to grow about 40 percent to 50 percent compared with 2018. Despite its privacy issues, Facebook managed to gain some new users, particularly in India, Indonesia and the Philippines. 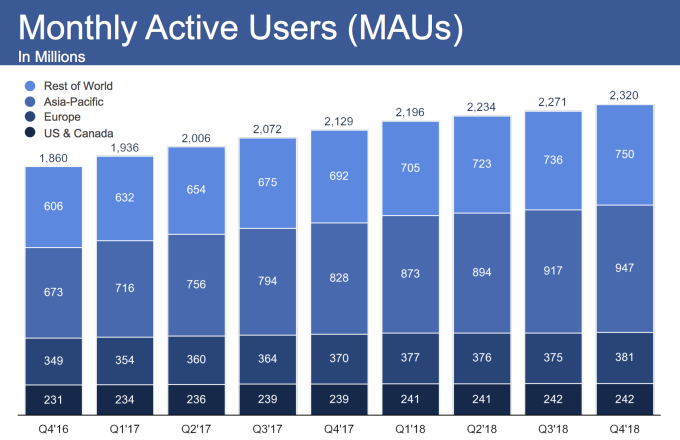 Facebook said more than 2.7 billion users interact with at least one of its apps each month, up from 2.6 billion last quarter. 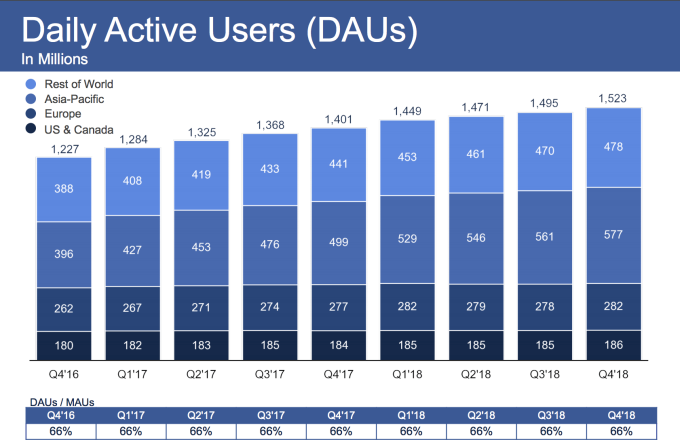 Monthly and daily users of the main Facebook app compared to last quarter were up 2.2 percent to 2.32 billion and 2.0 percent 1.52 billion, respectively. Estimates were for 2.3 billion monthly users and 1.5 billion daily users, according to company data. Facebook shares continue to trade at a discount to peers. Shares entering Wednesday of No. 1 online ad seller Alphabet Inc , for instance, were priced at 22.4 times expected earnings over the next 12 months, compared to 19.3 times for Facebook.